Lady Grace Talbot reveals the Castle? This painting is owned by the National Trust and stored at Hardwick Hall. 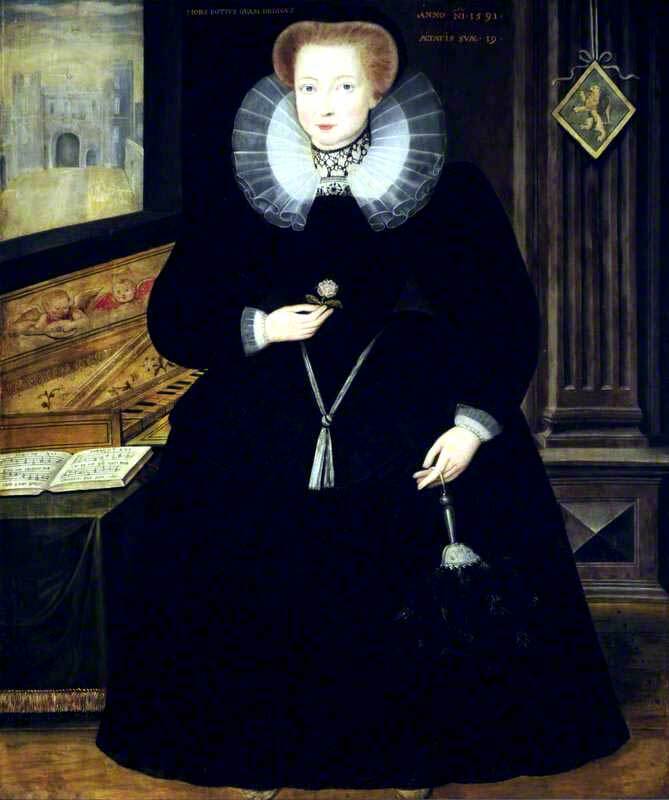 Painted in 1591, it shows of Lady Grace Talbot (1562–after 1625) was the third daughter of George Talbot, 6th Earl of Shrewsbury (c.1528-90), for whom she is in mourning here, and his first wife, Gertrude Manners, daughter of Thomas Manners, Earl of Rutland. She married, in 1567, Henry Cavendish (1550-1616), eldest son of Sir William Cavendish (1505?-1557) and Elizabeth Hardwick (c.1527-1608) and died without heirs. What is of more interest is the top left of the painting which (it can be argued) shows the Gatehouse of Sheffield Castle! 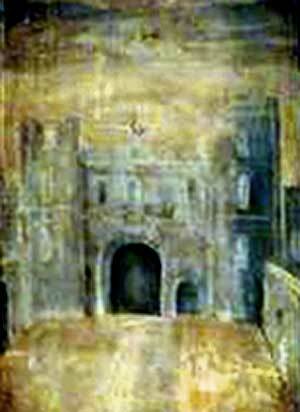 Opinion is divided at whether this part of the painting is simply to show her status and connections, or whether it was set within the castle and arranged so you can see out of the window. In either case, this remarkable image gives us a unique(?) glimpse of the Castle before it was demolished. As I mentioned when I circulated this picture, I have studied images of castles with Talbot and Shrewsbury connections and now personally believe that the image in the above picture is Tutbury Castle (just investigate for yourselves). On the question of “looking through the window at Sheffield Castle” – this is quite impossible as glass could not be manufactured at that size during the period in question. What a fascinating post and reply.I couldn’t wait to to broach this issue at our recent meeting.Now having looked at the images of Tutbury gatehouse on the Internmet I tend to agree with Marie. I’m not quiet sure about the technology of glass making in this period but would have thought it not impossible to manufacture a window of these dimensions- our glass museum in Sheffield could clarify that one.Intriguing post indeed. As I looked at the image of the castle on the screen of my computer I noticed what appears to be the faint image of a face, particular a pair of eyes at the top part of the image. It could either be an optical illusion, as the human mind does like to see faces in random patterns, or it could be that somebody used an old canvas and painted over an old painting. This was common practice then. This might be solved by X-ray and or infra red photo’s of the painting. I also noted the letters “T A” on the driveway to the castle. Sadly it looks as if we haven’t got a contemporary illustration of Sheffield Castle unlike that of Pontefract. John Baker our Membership Secretary points out it could be the inside of the gatehouse.